Researched Nutrtionals BDNF Essentials™ is a comprehensive supplement designed to support your brain’s healthy response to environmental challenges, as well as promote healthy brain activity with aging. 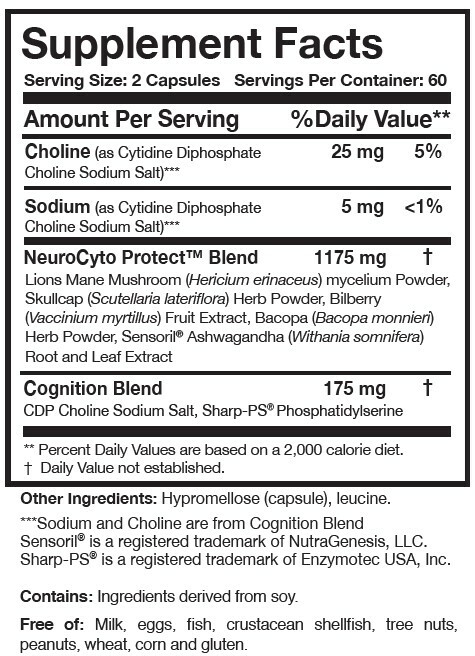 BDNF Essentials™ contains targeted herbs, mushrooms, and nutrients found to have brain supporting and protective properties that support memory, concentration, and cognitive processing. Many of these ingredients have been found in research to promote healthy formulation of nerve growth factors such as BDNF that help with neuroplasticity. Suggested Use: As a dietary supplement, take 2 capsules twice daily with or without meals, or as directed by your health care professional. Contains: Ingredients derived from soy. Free of: Milk, eggs, fish, crustacean shellfish, tree nuts, peanuts, wheat, corn and gluten.